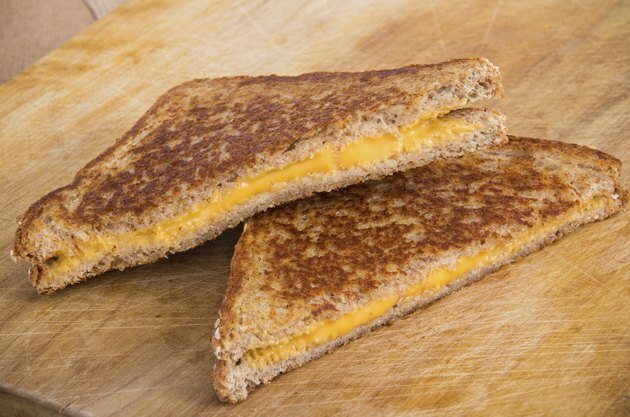 A classic grilled cheese sandwich contains one slice of American cheese between two slices of buttered white bread, slowly grilled in a skillet until browned. However, modifying the ingredients can adjust the calorie content. The total calories in a typical grilled cheese sandwich total 311 calories. The cheese contributes 77 calories per slice, along with around 102 calories from approximately one tablespoon of butter applied evenly over both slices of bread. Two slices of white bread contain around 132 calories. Substituting whole wheat or whole grain bread increases the calories by 15 calories for the same size bread. However, because whole grain or Italian bread is often larger than typical white bread the calories can be increased further and you may need to use two slices of cheese to adequately cover the bread, further increasing your calories. Selecting 2 percent milk fat American cheese reduces the calories by 39 calories per slice and the fat content by more than 75 percent. Fat free cheese offers 6 grams less fat content per slice and lowers the calories by 48 calories. How Many Calories Are in a Pierogi Potato & Cheese?